WHAT’S wrong with this picture? It’s late in Act II of King Kong and Queenie van de Zandt, as Cassandra, is singing the show’s most stirring number, Rise. As she sings, a chorus swelling behind her – and van de Zandt was in tremendous voice on Wednesday evening – we are to envisage King Kong climbing to the top of the Empire State Building where, we know, he will be destroyed. The climax of King Kong, the extravagantly scaled new musical, is at hand. Cassandra is given relatively little stage time, so at this late crucial point in King Kong the big anthemic number is sung by a character in whom there is absolutely no audience investment. Obviously she’s covering the set change that places Kong on the top of the Empire State Building. Obviously there should be more than that. 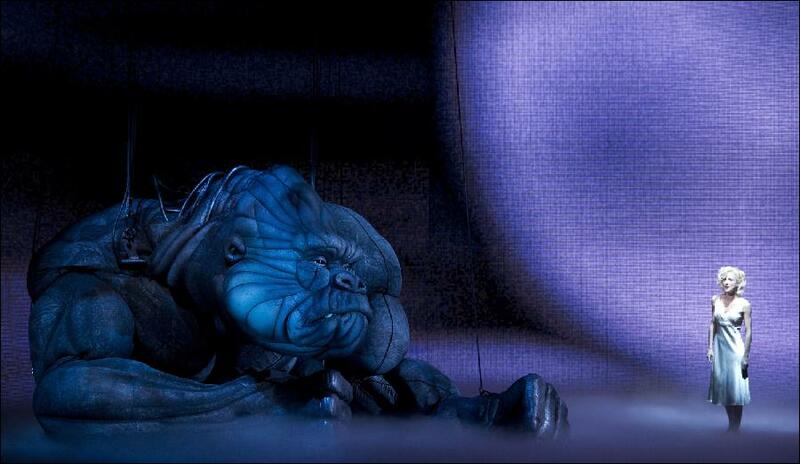 King Kong is, should be, about nothing but the highest stakes, something the show’s one unequivocal success proves. King Kong – the beast, not the show – is utterly, extraordinarily, splendiferously magnificent. King Kong producer Global Creatures has given audiences a creature to inspire awe and pity; to marvel at and to weep over – or at least potentially. As operated by a group of puppeteers called the King’s men, Kong expresses feelings unmatched by any living thing on stage. The body of Kong contains the key themes writ extremely large: colonisation, oppression, exploitation, migration, the outsider and, above all, devotion. The show touches on all this, albeit too many times with an unnecessarily heavy hand, but hasn’t yet managed an effective balance between the characters the audience needs to care about and those it doesn’t. I longed for a scene on the boat back from Skull Island that would show Kong in captivity and starlet Ann Darrow (Esther Hannaford) developing her compassion for him; without it Act II gets underway with the audience having to connect an awful lot of dots. On the other hand, I longed for savage cuts to be made to scenes featuring Carl Denham. The character is deeply unpleasant and Lyon lacks the adamantine charisma that can give an awful but seductive charm to such men. Since King Kong’s premiere in Melbourne last Saturday night there has been interesting and fruitful discussion about whether it really is a musical, or a spectacular, or a new direction in theatre that takes the book musical, adds elements unknown in the golden era of the 1950s, and creates something new. That’s all good to talk about, but is a separate issue from the nitty-gritty of King Kong’s weaknesses. The flaws have nothing to do with genre. They have to do with logic, shape, rhythm, tone and character development. And some of the dialogue is execrable, as if it’s what has remained after the scissors have been wielded over-enthusiastically to fit in more spectacle. (Craig Lucas, who is credited with the book, is a highly experienced and successful writer.) “I must be dreaming,” says Hannaford helpfully as scantily clad dancing girls emerge from nowhere on the Skull Island-bound ship for a fantasy scene. Oh dear, oh dear, oh dear. Surely there’s a better way to signal this if you doubt the audience’s ability to get what’s happening. Such dead language, and there are many other examples, is entirely at odds with the originality of the piece’s visual and musical aspirations. I loved the way the music mixed original songs (not all entirely memorable) with existing material, particularly when it included 1920s and 1930s references. There are brief snatches of Brother Can you Spare a Dime, I Wanna be Loved by You and the Lutheran hymn carol Joy to the World, the Lord is Come. There is stunning use made of Harold Arlen and Ted Koehler’s Get Happy, given surreal treatment with traces of Weimar Republic-era desperate wit. As the escaping Kong starts his rampage, a line of platinum-blonde chorines keeps the show going: “Get ready for the judgment day,” they sing. Quite. An eclectic approach is also taken to the show’s tone. There are traces of cheesy Saturday morning adventure flick, 1930s romantic comedy, futuristic sci-fi, camp send-up and early Dr Who – a hugely ambitious position that, I think, can only work if anchored by the strongest emotional through-line. Hannaford and Chris Ryan, as Ann’s love interest Jack Driscoll, do their best with the insufficient time they have to connect deeply – and they’d be helped by a more dramatic setting for their falling-in-love dance scene. In a show so ear- and eye-poppingly decked out with son et lumiere they look quite lost and dull here. And Jack appeared to be singing about men killed while building the San Francisco bridge (que? ), or did I get that wrong? King Kong needs a lot more work to achieve its goal of being the “timeless love story” it bills itself as, but gee, I hope it gets there. The big fella at its centre deserves it. All hail to Kong’s creators, who have given the huge creature expression, character and eloquent articulation. The puppeteers who animate Kong are involved in an intricate choreography that is entrancing in and of itself, but more pertinently they and the great wires that support Kong so visibly get right to the heart of the story. As men swarm over, around and under Kong there’s not only the excitement of his moving presence but a premonition of his subjugation. From the moment we first see Kong he’s already captive. King Kong shows in Melbourne only. It is currently taking bookings through to October 13 for groups and August 18 for the general public. NOT in Melbourne, but from Melbourne, comes Travis Cotton’s surreally comic sci-fi morality tale Robot Vs Art. A bit like King Kong in some respects, at about a millionth of the budget. There’s even a bit of the early Dr Who vibe about it. In a not-too-distant dystopian future, robots rule the earth of which humans have made such a hash. After some wholesale slaughter the men and women who remain are put to work as underground miners while the robots set about creating a weird kind of Eden. But then Executive Bot (Simon Maiden) has a mind to investigate this puzzling art stuff; stuff that apparently has some emotional value, whatever that is. Giles (Daniel Frederiksen) is a human who has done a bit of playwriting – cue many hilarious theatre in-jokes – and is charged with finding a way of getting art, and thus feeling, across to robots. This involves him working with unlikely thespians Claw Bot (Paul David Goddard) and Fembot (Natasha Jacobs). Some of the message-making is pretty heavy-handed (honestly, the similarities to King Kong keep piling up) but the show is a delight. Rough and ready to the nth degree, packed with great jokes, performed with tremendous elan and with a nice twist at the end. Much recommended. Bondi Pavilion until July 6.